Which song is your favorit off of Vulnicura? What's your favourite video from 'Biophilia'? Which 'Not Get' image is your favorite? What's your favourite video from 'Volta'? How do I get promotional code for konser tickets? Is Bjork still with Mathew B?????? Does anyone know the name of the song /video where Bjork is dressed in a white mantel and walking in snow? At first I thought it was Joga because of the mantel but that's not it. This was a few years ago. When Björk’s album Vespertine was released in 2001, it came as a bombshell. The singer, who up to then could reliably be found in the Electronic & Dance section, had turned away from the usual Drum & bas, bass sound and towards complex orchestral music. On Vespertine, choirs and violins murmured and Björk’s unique voice became the starting point for symphonic outbreaks and absences. So, it seemed to be only a matter of time until a classical musik genre would discover this particular jewel. 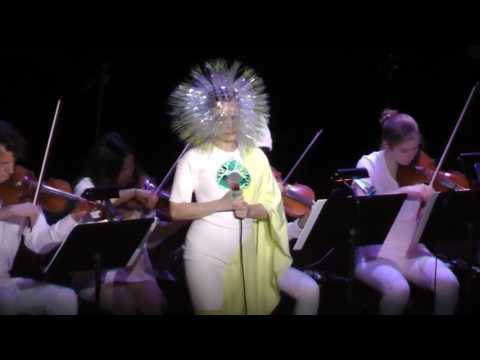 Bjork Bio with link to amazing videos. Which of these films has Björk NOT appeared in?